Cruise lines make it easy to plan nautical nuptials, with wedding coordinators to take you through each step and ready-made packages for purchase. Virtually all packages start with basic components and are customizable, with a variety of choices in food and beverages, flowers, photography, video, and more to personalize your event. Whether you marry on the ship, harborside, or in port, with just the two of you or with all your loved ones surrounding you, a wedding at sea is most certainly a voyage of romance and love. We offer some top package choices to make the entire process — from proposal to the big day — unforgettable. Imagine a ceremony on the hills of Tuscany, Italy, a beach in Bali, or in a winery in Cape Town, South Africa. Boasting “almost anything is possible just about anywhere,” Crystal Cruises’ Crystal Celebrations soiree service pairs the cruise line with premier global event company Imagine VIP. First, you decide on a port on one of the line’s two ships — Crystal Symphony or Crystal Serenity — and work with a Crystal Celebrations consultant to arrange your dream wedding. Everything can be planned a la carte or with a Crystal Ceremonies Ashore package that starts with a personalized website, wedding registry, local wedding venue, local officiant, commemorative wedding certificate, pre-planning Crystal Celebrations consultant, and wedding coordinator. You then get to pick from a list of inclusions, such as music, flowers, transportation, announcement/invitations, and more. Prices and Availability: Crystal Ceremonies Ashore packages start at $4,295. A range of catering options begins at $45 per person. View Crystal's wedding guide to learn more. Alternatives: Other cruise lines that offer in-port weddings include Carnival, Celebrity, Disney Cruise Line, Holland America, MSC, Norwegian, Princess, Royal Caribbean, and Windstar. Exchanging vows in the middle of the ocean can be the ultimate way to start your life together. Most cruise lines offer ceremonies at sea, but not all of them are legal — some may be symbolic — so be sure to ask. Princess Cruises was the first line to offer legal marriage ceremonies at sea conducted by the captain, as well as the first wedding chapel at sea, back in 1998. Princess’s Tie The Knot At Sea wedding package includes the wedding chapel or other onboard location, candlelit ceremony performed by the captain, special vows, prerecorded music, fresh floral arrangements, bridal bouquet and groom’s boutonniere, Champagne and keepsake flutes, photography, a wedding cake, and onboard wedding coordinators. Price and Availability: The package starts at $1,800 plus $466 for license fees. The program is available on most ships, with weddings performed by the captain under the legal authority of the ships’ Bermuda registry. Princess’s wedding program assists with all required paperwork associated with Bermuda regulations. Receptions following the wedding can be held in a number of the ships’ restaurants or public lounges, with prices starting at $21 per person. See Princess’s weddings guide for more details. Alternatives: Other cruise lines that offer legal weddings at sea include Celebrity Cruises, Cunard Line, MSC Cruises (on MSC Divina Caribbean sailings only) and Royal Caribbean International. A harborside ceremony allows you to get married on the ship while it’s in port — including embarkation ports. You can invite non-sailing and sailing guests, allowing you to decide whether you want to sail into the sunset alone or with friends. Norwegian Cruise Line’s Harborside Ceremony includes priority check-in for the bridal couple and their friends and family sailing with them (non-sailing guests are allowed to attend the ceremony and reception), a local non-denominational wedding officiant, a wedding coordinator, ceremony vows, music, bridal bouquet and groom’s boutonniere, wedding cake, bottle of sparkling wine, and assistance obtaining a marriage license. Prices and Availability: Package prices start at $1,995 and vary by port. The cost for a reception begins at $37 per adult/$16 per minor ages 6 to 16. View Norwegian’s wedding brochure for more information. Alternatives: Other cruise lines that offer harborside weddings include Carnival Cruise Lines, Celebrity, Holland American Line, MSC, Princess, Royal Caribbean, and Windstar Cruises. A cruise can also be a memorable way to pop the question. Royal Caribbean’s Royal Proposal package makes it easy to get the response you want. It includes working with a romance specialist to find the perfect onboard setting, coordinating details to ensure the ideal moment, and consulting with a cruise program administrator, plus a single long-stemmed red rose, Champagne breakfast in bed for two, chocolate-covered strawberries in your room one evening at turn-down, and one hour of photography (photos not included). Price and Availability: Rates start at $450. See Royal Caribbean’s Royal Romance brochure, which features all the cruise line’s wedding and romance options. Alternatives: Though most other cruise lines do not have official proposal packages, many —including Norwegian — can assist with special arrangements to make the event memorable when set up pre-cruise. If you bring along friends and family for your wedding at sea, remember the trip is not just about the big day but about the week or few days you are together with them as well. Celebrity Cruises offers a number of packages that help build excitement and allow the bride and groom to spend some fun extra time with their guests. Among the choices are a Bridesmaid Tea Party that includes a variety of specialty teas; scones served with clotted cream, Devonshire cream, or strawberry jam; sandwiches; pastries; chocolate cake; and French Napoleon. Rates start at $18 per person. A Cigar and Cognac Party starts at $28 per person and includes pre-planning arrangements, an onboard event coordinator, one hour of premium open bar, and a choice of premium cigars. Before committing to your wedding with Celebrity, you can book a Test the Waters Pre-Wedding Consultation & Tour, starting at $275 per couple (additional guests are $45 per person). 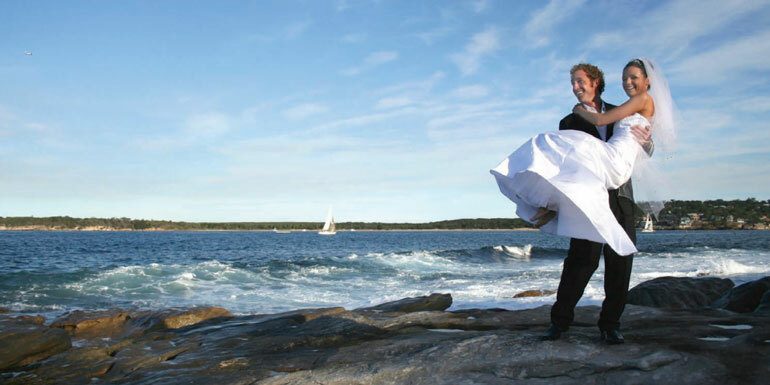 The 90-minute package includes pre-inspection arrangements, site inspection with a wedding coordinator, a 30-minute tour of the wedding and reception locations, a 30-minute consultation of the wedding props, site photography, setup, and question and answer session, and a 30-minute open buffet lunch (with other sailing guests). Learn more in Celebrity’s wedding brochure about its comprehensive list of wedding packages. Alternatives: Most cruise lines’ group departments can arrange special dining and other events for wedding guests upon request. Through Norwegian’s Let’s Do Lunch program for travel partners, prospective clients may join their travel agent for lunch and tour the ship prior to booking. MSC and Royal Caribbean can also make prior arrangements for prospective brides and grooms to tour the ships. Don’t forget to take time out for some romantic pampering for just the two of you during your voyage. Most cruise lines offer full-service spas that feature an extensive list of spa treatments, as well as hair, makeup, and salon services to get you ready for the big event. Before or after a Disney’s Fairy Tale Wedding with Disney Cruise Line, take advantage of the onboard spa to indulge in romance with a couples massage in a Spa Villa. This private space includes an indoor spa treatment suite connected to a private outdoor veranda with its own hot tub, open-air shower, and chaise lounge. It’s also a great place to escape from guests for one-on-one time. Prices and Availability: Couples Spa Villa rates start at $449. Find out more on Disney’s wedding packages page. Alternatives: Any ship with a full-service spa can offer plenty of pampering options for brides, grooms, and their wedding guests. Have you ever been to a cruise ship wedding?